Michael D. Ettinger graduated from John Marshall Law School with honors in 1970. He worked as Cook County State's Attorney eventually being assigned to a felony courtroom where he worked diligently for a number of years. As a state's attorney, Michael was assigned to the Fifth District Courthouse located now at Bridgeview, Illinois. He has remained in the same area throughout his law career and concentrating his criminal practice in the southwestern suburbs of Chicago. Michael eventually moved onto private practice naturally concentrating in the criminal defense realm. 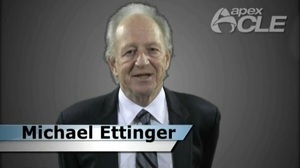 Mr. Ettinger became a Fourth and Fourteenth Amendment Advocate on behalf of his clients. Throughout his years in practice he gradually move to a concentration in white-collar crime in the U.S. Federal Court system. Michael D. Ettinger also represents clients in drug/alcohol offenses, political and corporate crimes and civil rights violations. Mr. Ettinger is known and respected in Federal and State Courtrooms not only in the State of Illinois but throughout the United States. Ettinger & Besbekos P.C., as a law firm, specializes in complex federal and state criminal and civil matters with the utmost professionalism. The law firm represents individuals in various criminal charges including but not limited to: driving under the influence, domestic battery, drug related charges and minor traffic citations. Our firm is fully capable in handling multi-faceted family law issues and all other civil cases.